Snaring Sets, the primal hunting tools for survival! The perfect emergency tools for any survival kit! It's the oldest -school way to capture animals for survival food. 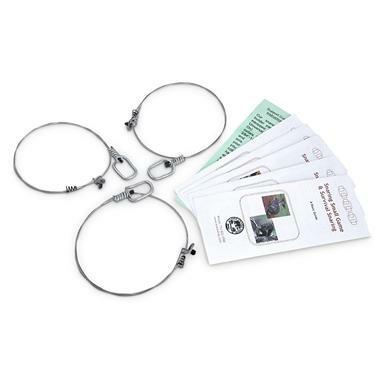 All of the Snares are made of strong cable, with a Micro Lock system on the small sizes and Cam Lock on larger sizes for a firm hold. Make sure these snares are part of your bug out bag contents. Please check local regulations on snares. 6-Pk. of Survival Snares is rated 4.3 out of 5 by 50. Rated 5 out of 5 by big red from Best I have seen for cost and how will made. I bought them first from S.G. 110, 220 trips. I got some before this for what if. I later wanted more. All I found cost more and where far less made well. 110. 220 trips where the best I have found and lower in cost. The best I have seen so far from you S.G. I will not go any where but here. Rated 5 out of 5 by Scott from Look like quality Haven't used them yet, but seem very sturdy and well built. Rated 5 out of 5 by MrNobody from High Quality Okay, now you've got some great snares. The squirrels and bunnies will jump right in 'em, right? No, sir! Get out and practice, then practice some more. I have been having fun watching small game habits around my house. Be sure and think about what you are doing. Is it legal to snare in your area? Might a neighbors dog or cat get stuck in your snare? Snaring is a great way to get to know the woods. Good luck! Rated 5 out of 5 by KEN from Bought just for SHTF. I hope to never have to use them.